When Captain Phasma’s out in space hunting down deserters or polishing that impractically gorgeous armor, she’s usually aboard a First Order Star Destroyer or a Stormtrooper transport. When she’s here on earth though, she’s probably driving something like this wild Nissan Maxima. As a rule, the Star Wars brand is staunchly against product placement of any kind within its films—you’re never going to actually see Phasma roving around in a luxury sedan with a blaster mounted on the roof. But Nissan’s been working with Industrial Light & Magic and Burbank’s Vehicle Effects shop to produce a series of limited edition vehicles styled after characters from the Star Wars universe. 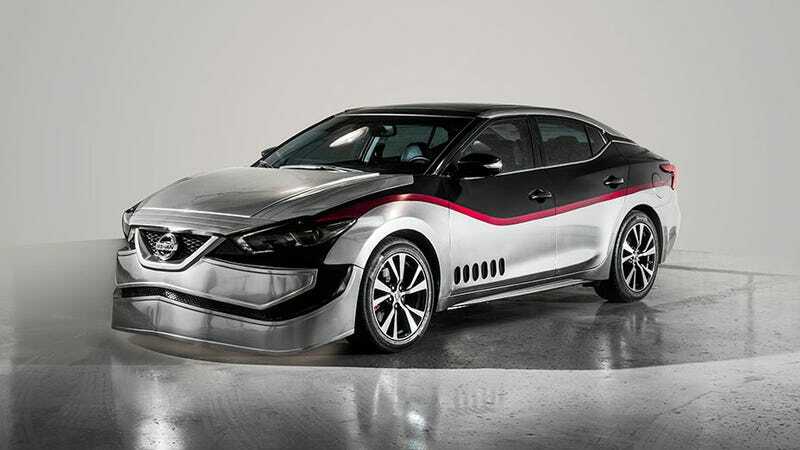 While the Rogue One-themed cars (styled after Stormtroopers) were fine to look at, the Phasma-inspired Maxima is striking on a whole other level. The Maxima, which took 100 hours to go from 2d to 3D and another 200 hours to fabricate, will be on display at this year’s LA Convention Center between December 1-10, but if you can’t make it there, Nissan will be visiting multiple auto shows in coming months with VR experiences to put you in the driver’s seat.